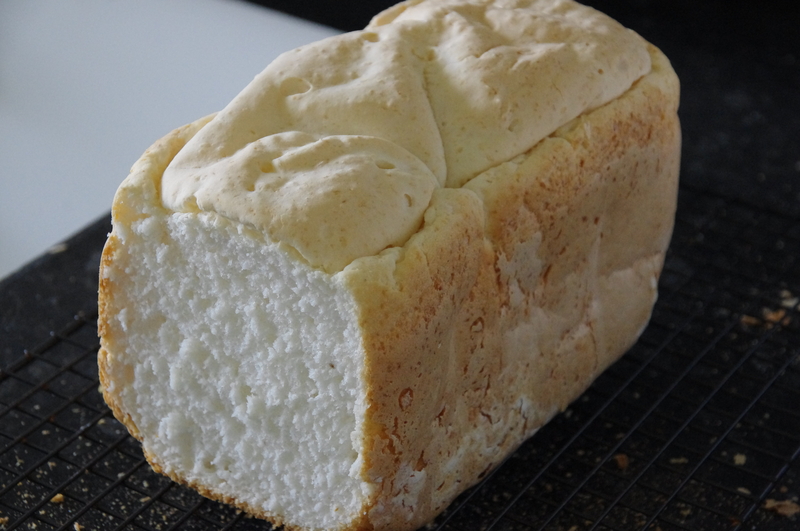 So I tried this bread recipe in the breadmaker instead of doing it by hand. I hoped it would result in a smoother looking loaf, and it exceeded my expectations! I know there’s a lot to be said for the old fashioned ways, but let’s not neglect our breadmakers! All I did was chuck all the ingredients in and turn it on – I didn’t do any mixing or kneading by hand. 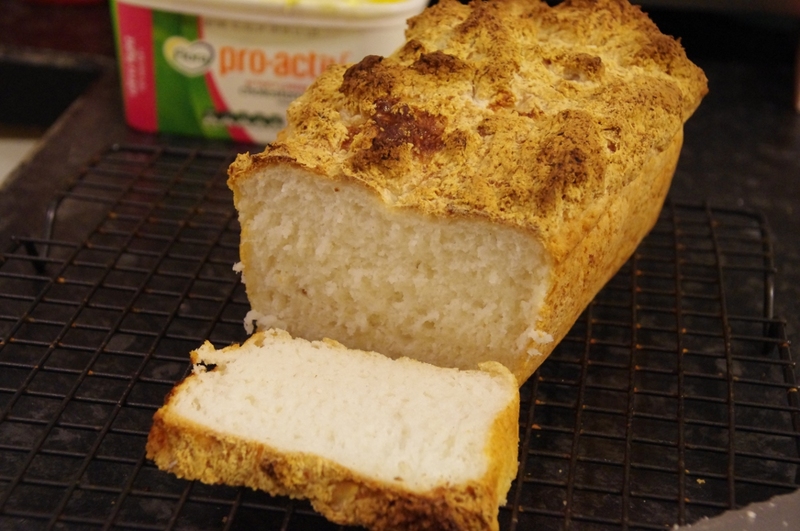 The totally lazy way, but still a lovely home-made gluten free loaf of bread. Put 1 cup of lukewarm water in a bowl. Add the yeast, sugar, gelatine, salt, and psyllium. Lightly whisk to mix. Cover, and leave for 15 minutes. Add citric acid, flour, and egg whites and mix well. Cover and leave for 20 minutes. Beat for 1 minute, then scrape dough into a small greased bread tin. Cover and leave for 25 minutes. Bake at 220 degrees Celsius on a low shelf in the oven. Don’t slice until cooled. 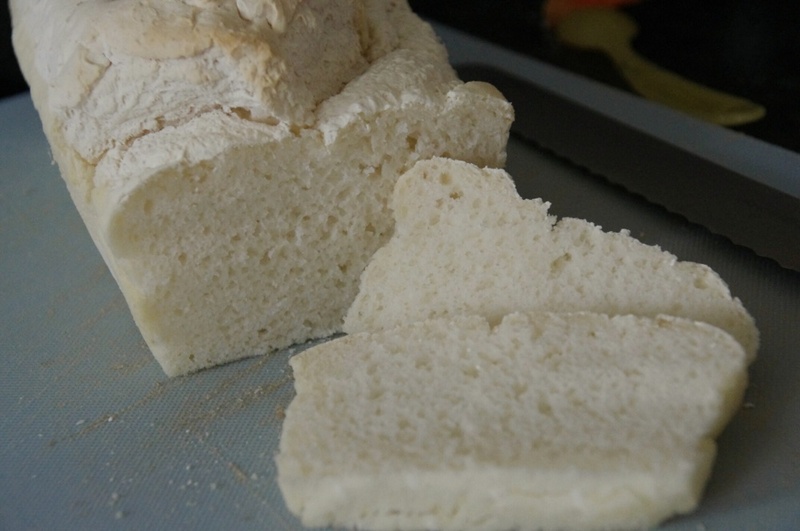 The starter needs to be made at least 48 hours before you bake the bread. Mix all starter ingredients with 1 cup of lukewarm water, and put aside. Stir twice daily. When ready to bake, pre-heat oven to 180 degrees Celsius (360 Fahrenheit), and grease a loaf tin. Put the starter, 1/2 cup of warm water, and all other ingredients in a bowl. Mix well, or beat with an electric mixer for two minutes. Put on a low shelf in the oven and cook for 40 minutes.